The dart flight has changed greatly over the past hundred years. 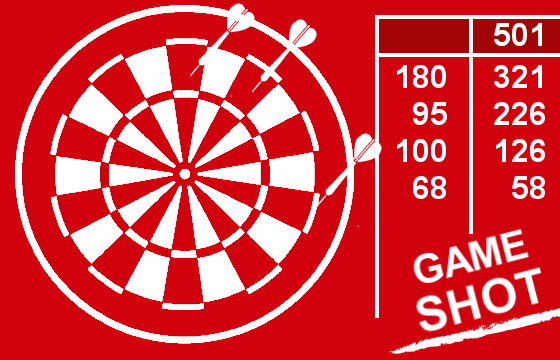 Until the end of the nineteenth century, the majority of darts thrown in the UK were imported from France. 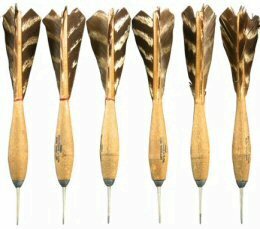 These wooden darts had three or four turkey feathers that formed the dart flight. The wood dart was weighted with lead to give the dart some balance and a needle was used as a point. Later versions of the feathered flight saw the introduction of the wooden spigot which was forced into a brass dart barrel. This arrangement was unsatisfactory as the spigot was subject to shrink and swell in different atmospheric conditions. In 1949 Unicorn Dart Company invented an adaptor for the wooden spigot. The screw threaded plastic adaptor was not affected by changes atmospheric conditions and was always a perfect fit for the dart barrel. The wooden spigot was force-fitted into the back of the adaptor and this carried the feather wings. A set of Unicorn Feathered Flights can be seen here on the right. By 1954 Unicorn had produced a wide range of Spigot Flight these came in various colours and shaft length. Later again we would see the emergence of the full plastic flight and stem. This construction is still used and produced today and various modern versions of this setup are available. The main advantage of the flights is they last and are less likely to brake and the wings of the flights always remain true, unlike the folding flight that can become untrue. 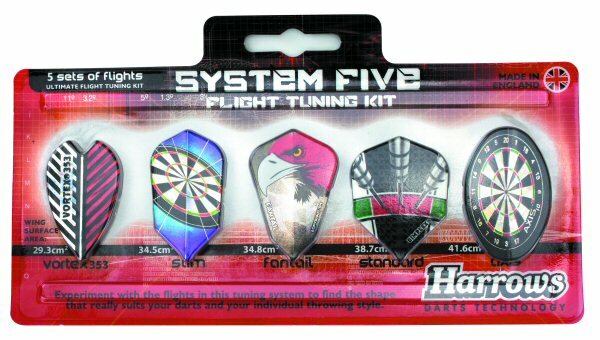 However, this type of plastic flight combination isn’t as popular now as it once was with most players opting to use separate flights and stems. 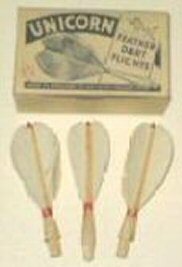 Although the first dart flights were made from feathers it wasn’t until 1898 when an American inventor Nathern P. McKenney patented the world's first paper flight. 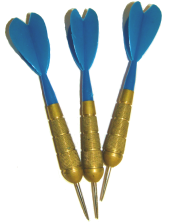 Although darts was not a popular American pub game until the mid-twenties, McKenney is reported to have stated he had patented the flight as an improvement to a toy dart target game. A 2” (approx. 5cm) paper square is folder as above and inserted into the wooden dowel stem. Paper flights became commercially available in the 1930’s, these flights came pre-gummed similar to an envelope adhesive. You still had to fold them the same way as McKenney’s patent but the flight design was different in shape. 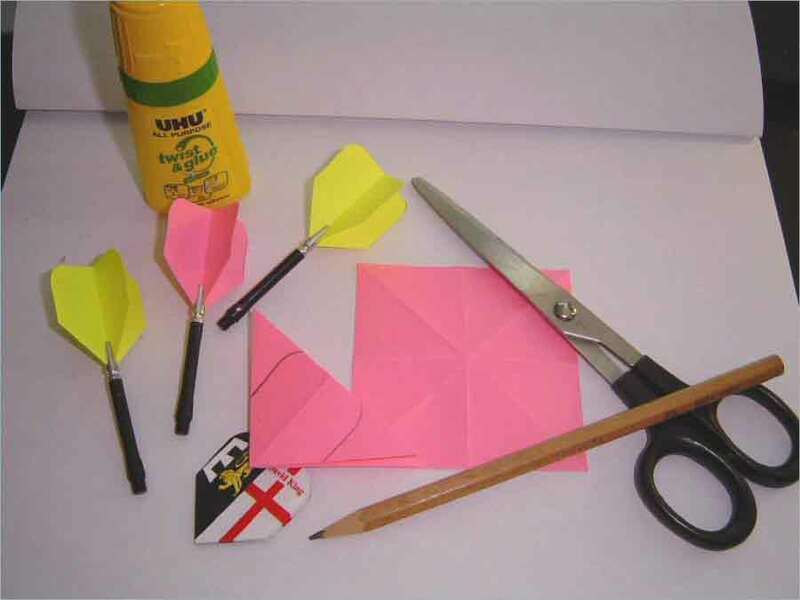 Further details regarding the originality of the paper flight can be found on Patrick Chaplin’s (Darts Historian) web site. Why don't you have a go making your own Paper Dart Flights? If you would like to make some retro flights the best material I found to use is a square Post-It-Note. 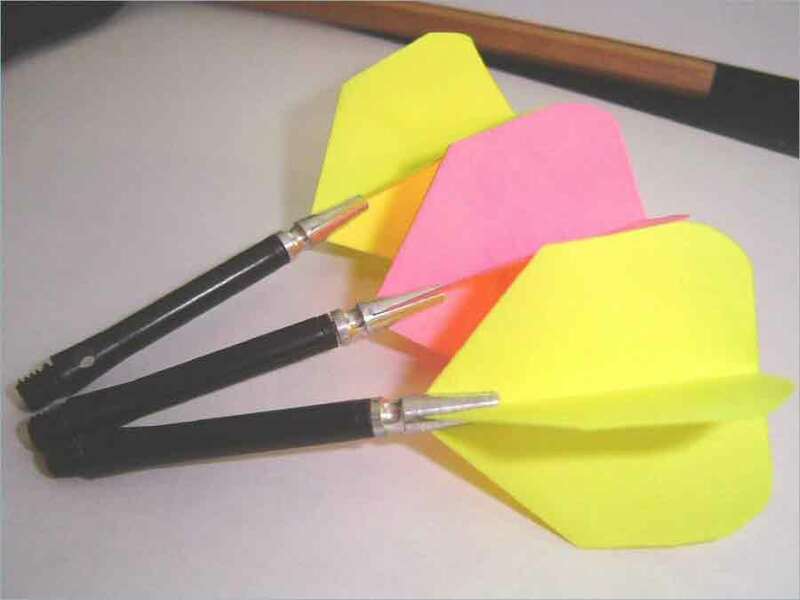 Post-It-Notes are available in a large range of colours and they are the ideal size to make a dart flight. The only change I would make to the above is to trim the side so that the flight looks like a conventional dart flight. If you have an old dart flight, use this as a template. Second, fold the paper into the flight shape as above. Thirdly use an old dart flight as a template, and draw around it so the paper flight takes on a modern day look. Fourthly cut around the marking to form the flight after you have folded the paper into the flight shape. Lastly, lightly glue the flight together. Here is a set that I made using Post-It-Notes, it is very quick and easy to do, and they also work very well! Flights can be very personal and I have designed my own set. The flights are unusual as they are based on the oldest English ‘King’s’ coat of arms I could find. The Lion with the red tongue on a black background with the three-pointed white argent on the left and the Cross of St George for England on the right. 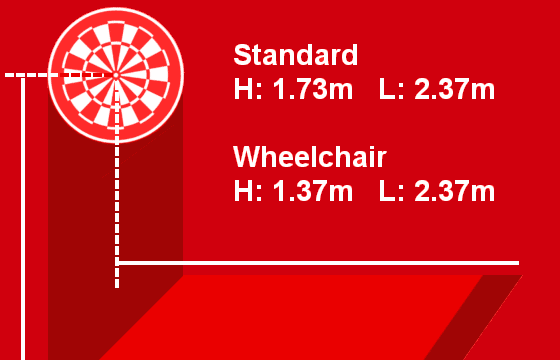 I don't want to go into any more about heraldry as this is a darts site but there are details below about how you can obtain personalised flights from Harrows below. 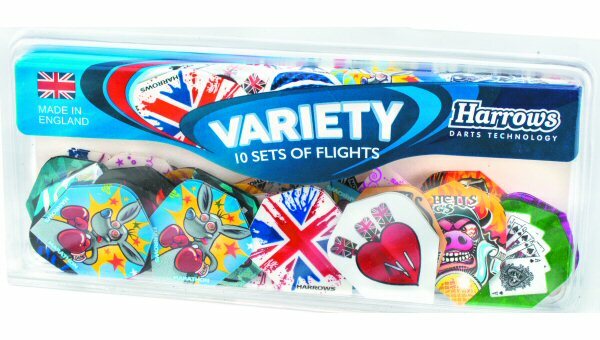 Today there are many different shapes and styles of flights on the market. 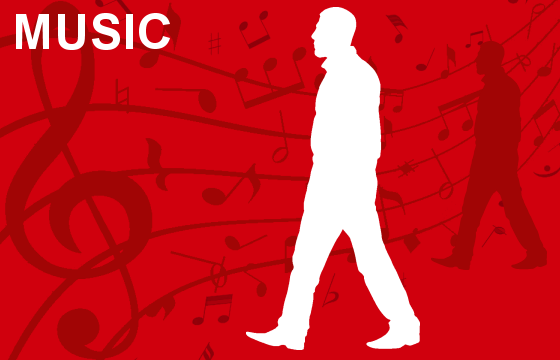 There are 1,000’s of different designs, styles to choose from. The materials used to construct have also changed, Plastic polymers, nylon, foil & rip-stop nylon to name just a few. 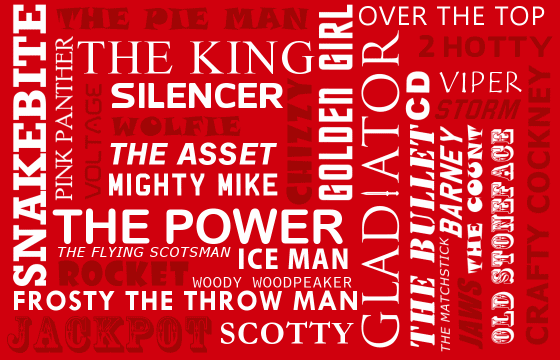 Here are a few examples of the many shapes and styles. Like shafts, flights are a personal preference. The material used to make the flights, its shape and size will all make the dart perform differently. The traditional shapes are the Kite and Pear but recently the slim has become popular. 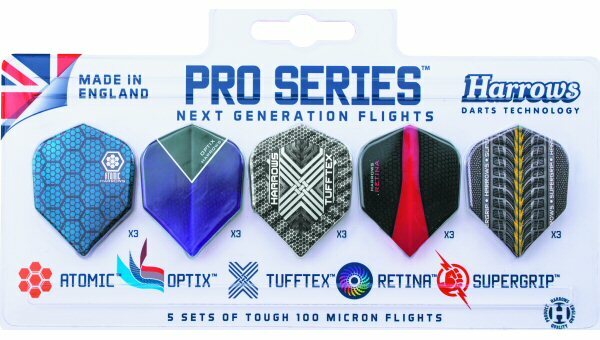 Slim flights will help with tight grouping but they are not to everyone’s preference. 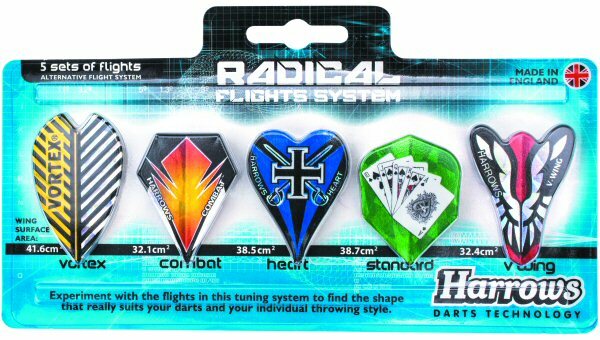 You may find differently shaped flights perform better with different weight darts. But generally large flights can make the dart stall and if you are a lobber of the dart then a large flight may be best suited to your throw. Slim flights require a much harder straight throw as they give less support in flight than larger flights. When first finding a suitable flight, buy several different types and see which style suits your style of throw best. If you would like to read more about the heritage of darts, flights, shafts please view the Unicorn darts.